Player mods may not come out looking good compared to the base game, which has been tested against thousands of players for millions of hours. They may do neat things, but they have had less than scrupulous balancing applied. Evaluating player mods is difficult and time consuming in a rogue-like. A few playthroughs is not enough to see everything, less evaluate it. Did I see only the lousy cards or the overpowered ones? Did I get the wombo combo early or never? Am I really willing to spend hours digging through poop in hopes there is a pony in there? Special shout out to mods with cards that are straight-up better or worse versions of existing cards. The exact same effect with a different cost, or the same effect with a different number, is either an argument against the original game’s balance or a sign they didn’t even notice it. Maybe the different numbers make sense in the context of the new class, given its other mechanics and cards, but probably not. We played through the campaign of Charterstone. It was OK? Charterstone is a legacy worker placement game. “Worker placement” is a game type where you place workers around the board to take actions like harvesting clay, building buildings, and turning in completed quests. “Legacy” means that the game changes over the course of the campaign, rather than being a series of isolated games. In a non-legacy worker placement game like Lords of Waterdeep, you expand the buildings available over the course of the game then wipe it out when you’re done. In Charterstone, your village grows over time as you add and replace buildings. There is also a storyline across the games, with rules and complexity added over time as well as changing the rules to simulate story events. The game is not a massive, branching path, so player decisions have almost no effect on the storyline. There is a cumulative effect, and there is a climactic battle determined by earlier decisions, but you make those decisions with little information and no indication of future impacts. You are familiar with this in games: make a decision right now that will have permanent effects, with little context and no explanation of its implications. This is usually considered bad design. The quick tip here is that making the mechanically disadvantageous decision is usually the one that gets you closer to the “good” ending. And the entire difference between the “good” and “bad” endings is the flavor text on two cards. We played Charterstone with two players. It is a 12-game campaign, and you want people to commit to the whole thing before playing. That’s kind of rough, especially if you want a full game of 6 players and have trouble getting them to commit for a regular gaming event. Even if they want to commit, life happens. 7th Continent has rules to drop in or out; Charterstone has them only for dropping out. In a two-player game, we missed most of the gameplay conflict, as there is lots of space on the board, and the range of options was somewhat limited as the other parts of the village filled up with random buildings over time. There were always lots of options, but “fill in the empty charters with random buildings” gives you a mix of poorly developed options, while your own part of the village has the custom engine you have built up over the course of the game. The rules explanation is just bad. In an attempt to keep the new mechanics a surprise, the rulebook starts mostly empty, and you fill it in over time. That can lead to references to things that do not exist. The first game explanation seems inadequate, so watch the recommended video. There is an official FAQ, but by reputation its “mild spoilers” are not all that mild, which makes sense given the thinness of the story. Also, just looking at the questions will give away things being asked about. I really wanted to like Charterstone. If nothing else, it seems like good discipline to treat a game as something temporary, consumable, and alterable, rather than something I must keep pristine and preserve. You probably have many games you have never played a dozen times, so if you run through the campaign, you are getting your money’s worth. I just think you would get better time value out of better gameplay, and you can read the storyline in about five minutes. As a last big thing before the official release in two weeks, Slay the Spire now supports mods. There have been mods for months, but it is now supported through Steam Workshop. At a friend’s suggestion, I am going to start trying out mods, particularly modded characters. When you have played 400+ hours, you may need something new to keep it fresh. I expect some to be well conceived, some to be poorly balanced, and generally to enjoy fumbling around with “is this bad or am I doing it badly?” Because Slay the Spire was my first real “git gud” game. One nice thing about mods, rather than the base game, is that they can be ridiculous and that’s OK. Like the modifiers you can add in custom mode, you can intentionally make the game much harder, easier, more random, etc. That is both adjusting the game to fit your own needs and doing something silly you might enjoy occasionally but not want every time. God mode is fun for a little while, even if it is toxic to the game in the long run. If you have mods you like and want to recommend, the comments are open. Also note that the win condition (fear, kill invaders) is totally decoupled from the loss condition (too much blight, no presence). That means you can be very close to winning *and* very close to losing at the same time. This is not a coincidence, by the way. It was a very intentional part of the design. The result is that players can be much closer to winning than they thought because they were only thinking about whether they will lose. In most games, being close to losing means far from winning, so it feels like you’re further than you are. The upshot is that you can often win at higher difficulties than you’d otherwise expect. One of the things Spirit Island does well is making easy games feel challenging. Players like feeling challenged and they like winning. Spirit Island delivers both. A common feature in Eurogames is a scoring mechanic (sometimes hidden) that keeps all players in the game until the end. You can recognize that someone is ahead of you, but you do not face a loss condition that eliminates you from the game. Contrast this with games like Monopoly or Risk, where eliminating opponents is the point of the game. Contrast this with games that do not have win conditions as such, just that you can lose The Game and the goal is to not-lose. When we play a game with a loss condition, losing tends to mean being far from winning. The losing player has few playing pieces, little power, etc. Losing is far from winning. A mechanic more common in survival games is a race. You are trying to win before you lose, which seems like a tautology but plays differently from games where you are not racing against a loss condition but rather against other players’ attempts to win first or against other players who win by making you lose. Spirit Island victories tend to feel either really amazing or kind of trivial. Racing against a loss condition can feel like kind of a cheat, as you steal victory from the jaws of defeat. A game like Blood Rage makes that a central mechanic, where it is Loki’s strategy is to win by losing. American games and stories tend to favor action heroes over guile heroes, so we are culturally primed to see “a trick” as generally a bad thing. You are supposed to smash your enemies, not win by getting a ninth fear card as they are on the verge of overwhelming the island. But that can also be an amazing feeling, as you see the race happening and roll under the closing door like Indiana Jones. Other times, you are clearly ahead in the race but will take a while to claim technical victory. There are rules to bring about the end one way or the other, but if you get an early lead and just need to check off one box to win, it can become a dull waiting game as you try to whack that last mole. This is rarer and usually a sign you should dial up the difficulty. But sometimes this creates the most amazing crescendo, where the only anticlimax is that your big turn at the end is so overwhelming that you do not get to play it all out. Your power accelerates as the enemy’s does, which gives you more targets and more ways to crush them. It is not uncommon to have a problem area festering on the map throughout the game, only to wipe it out in a turn or two, sweeping the invaders from the land while generating large amounts of fear, potentially hitting both win conditions on the same turn. The enemy buildup creates tension, and big tension leads to big explosions. Finally, as the developer says, the games tend to feel closer than they are. The enemy is building up and spreading as you are, so even if you are way ahead of the curve, you can still get these hordes of enemies you are trying to contain. Unless you are very safe, you do not feel safe, and even then the next wave is coming. As a gameplay note, I recommend having someone actively monitoring the win condition and calling it out at the start of the turn. It feels less like winning “just happened” if you can see that you are building towards it. “We are at terror level 2. We have 2 cities and 5 towns to clear out. We win if we eliminate all the buildings, or if we can clear those two cities and get 11 more fear. Invaders ravage in mountains this round then build in sands.” This is especially helpful for new players, because it focuses them on what is more important in the game right now. The Steam winter sale is going on now. You already know this. Slay the Spire is on sale. In January, the game is leaving Early Access and getting a permanent price increase. This is the best time to buy it unless you are going to wait for it to be 75% off the new price. I’m a guy who waits until everything is 75% off and/or $5 or less, and half the time decides I don’t really want it by the time the price gets that low. And I bought Slay the Spire for full price. And it would have received good value for four times that. Computer game: Slay the Spire. There is nothing I have played or enjoyed more. It is a great rogue-like deckbuilder at an indie price, with lots of variation and replayability. It has a very high skill ceiling, and you can also dial up the randomness if you prefer that. Board game: Spirit Island. It is a deep strategy cooperative game with variable powers and strong theming. It places you in the opposite of the usual game role, driving off the settlers. This can also be played in modes that are almost purely predictable or with increasing randomness. It also plays excellently as a solo game. I have played Spirit Island every two days since I learned the game. It is great, although difficult to introduce to large groups. What are your top games this year? I don’t have the interest to get involved in the latest kerfuffle, and by the time you read this it could be an entirely different kerfuffle, but this remains the same. Ravious and I had the chance to see WildStar pre-release. There were some great people making great systems, props, etc. The game as a whole had a feeling of “let’s throw everything into the mix and hope for emergent gameplay.” And it just shut down permanently. 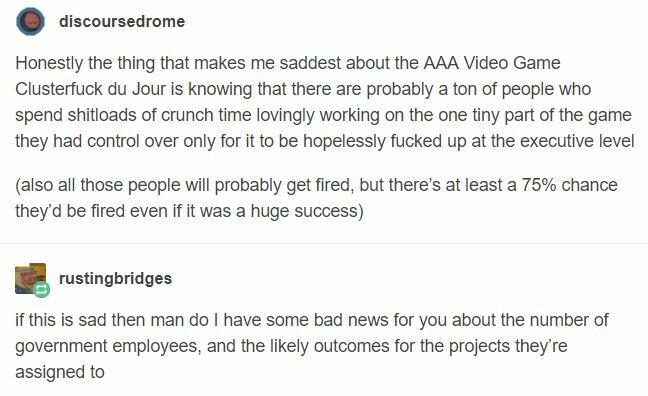 People worked for years, and you know how hard folks work in the game development industry. And at this point, the best I can say is, “I hope it was fun while it lasted.” It wasn’t a lot of fun when I tried it. A recurring thought I have at work is that it is necessary but not sufficient for our office to do a great job. That, for the system as a whole to succeed, we must succeed, but our success is not enough to carry the rest of the system. We can do great things that immediately get trashed by the next step in the process. The actual ending of Slay the Spire is now available, an unlockable 4th act. It is not much of a 4th act, but it gives you a final boss fight for the game. I don’t think it adds much except for a sense of finality. Except that you can immediately start another run, so final isn’t final. Slay the Spire has clearly been my game of the year, providing me with more playtime than most MMOs I have tried. It’s great, worth buying even without a sale. It feels a little anticlimactic that adding the final boss seems less significant than some of the regular weekly updates. The baseline for the game sets the bar pretty high. NGU Idle is a relatively entertaining idle game. Its developer also explicitly trolls players in-game. There is a “troll challenge” where random annoying things happen, from losing progress to spamming pop-ups to a slowly moving picture of a cat. But for my money, the best one is having a “did not drop” message for a particular rare drop item. It says that you see the ring, but it crumbles to dust before you can pick it up. Better luck next time! I am imagining WoW raids, where a boss’s death animation includes visibly dropping a legendary item for your class … which an NPC zips in and swipes before you can do anything. That would be the most hated NPC in the game, and players would buy an expansion solely for the chance to kill it.